Here I am delivering the first FREE download on Green Lily Designs as promised! These little white paper bags have been waiting for the perfect project. I think you'll agree this bunny and chick are worth making. These would be great party favors or friendly gifts filled with treats for all to enjoy. If you want to see more free downloads on Green Lily Designs leave a comment and let me know. Simply download the pattern, then print the bunny and chick on 3.5x6.5 inch white paper bags, cut around the ears and head and you're done. You can even add a little pom pom bum for a finishing touch. *If you're printer won't allow you to print on the custom size, you can print on sticker paper and adhere it to the sacks. Those are so cute. I'd like one filled with Reese's Peanut Butter Cups! The entire world needs to know about this! these are so cute and ideal for Easter sunday parties! Thank you for the adorable patterns! I'm in love! Free patterns are so wonderful! Have a lovely Easter! You made mine sweeter! Thank you so much! What an adorable pattern! 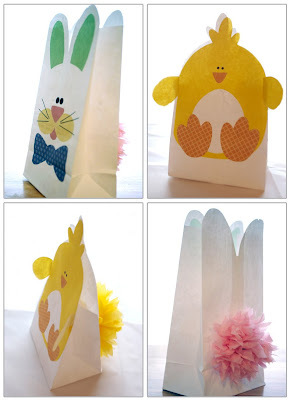 These bunny and chick bags are adorable - a great creative idea for printing on white paper bags. I've added a link to this free printable from Crafty Chick ... and yes, we want to see more! Thank you for providing the templates. Kisses, Karina. Those are adorable, what a great idea. Found you on Skip to my Lou. ooooo I love it!!! Thank you so much for sharing. Thank you so very much for sharing your creations! My children will love these cute bags! These are adorable, nice job! These are super cute, thanks for the free download. thanks!!! I´ll feature on my blog...hope you don´t mind. So cute! I use to make these many years ago when I had a preschool in my home. I am sharing your link today on my FB page. So cute! I´ll make it! Thanks! Is this download no longer available?? Your download isn't working...??? I would love to get it. Could you please email me Thanks! I think its sooo cute! Can you send me a link for the download? alexys_@hotmail.com. THANKS!! Are you reading your comments lately? The download is not working. It takes you to a place that is full of advertisements. Thank you very much for your attention to this matter. Hi Ami. you are creative. Hello. Thanks for stopping by and checking out some of my designs. Shop for your favorites here!